Register here as a client and send us an email to activate your professional account. 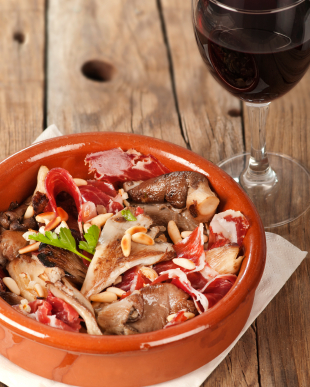 Jamonarium offers to restaurants and gourmet shops the possibility of acquiring our products with advantages. Contact us with all your information about your company or business and we will tell you more about it. - Our products are of a real good quality; guaranteed. - Special rates and discounts for restaurants and gourmet stores. - There is no minimum amount to order. - We prepare your orders for you to receive them as soon as possible. Register here with your company name, billing address and VAT number. Your restaurant or shop must be in operation and registered. Send us an email to aware us of your registration. After its verification, we will activate your account as professional. From that moment, you will be able to make purchases with all the advantages. Please always pay in advance (Credit card or bank transfer). We've got very interesting ideas for Restaurants, with a lot of possibilities to prepare very special dishes. See our recipes. 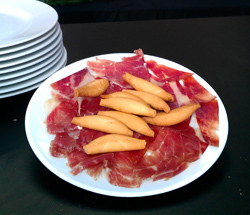 Tapas of Pata negra ham or sausages sliced, open and serve. 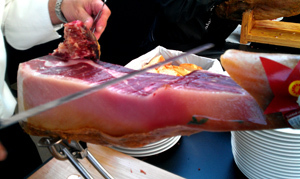 Wondering how to prepare pata negra tapas without slicing yourself? Try our 100g sachets, you only need to open and serve on a dish. View Iberian ham sliced and vacuum packed here. Nothing shines better in a Bar/Restaurant than a propper Iberian Ham with its corresponding Ham holder, We've got the best prices for Iberian ham with bone and a lot of interesting Ham Holders. Check our accessoires where you will find a lot of different Ham holders, slicing knives, knives sharpeners and accesoires packs. 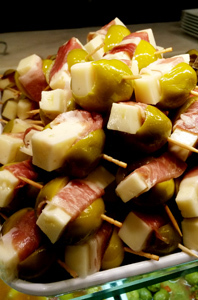 We have great Spanish products for Gourmet Shops, Grocery Stores and Event Agencies. Contact us and we’ll send you prices and benefits for professionals. Our proposal for Gourmet Shops and Grocery Stores are the boneless products, easy to cut, with a propper machine you wil obtain really thin slices. Our team of highly qualified professionals debone the hams, and cut them into pieces so they can be vacuum packed separately. Which is really practical for shops, because they can open just as much as they need and save the rest intact. Our proposal for Event Agencies is aimed more towards sliced and vakuum packed products, Our 100gr sachets are the fastest and easiest way to sell Iberian ham. You only need to open the sachets and serve the ham. These sachets can be stored up to 6 months in a fridge or in a cool place. Sliced ham and sausages is a perfect way to sell those products without the need of slicing them. Sliced products sachets may be kept longtime in the fridge, ready to sell.